LONDON -- Princess Charlotte has a certain ring to it. Or how about Princess Alice? Britain's newborn princess, the second child of Prince William and the Duchess of Cambridge, has spent her first night at home in London's Kensington Palace, but the guessing game continues Sunday over what her name will be. When the baby's older brother, Prince George, was born in 2013, the royal couple took two days to reveal his name, waiting until after Queen Elizabeth II had met her new great-grandson. Meanwhile, Britain's legal bookmakers have been busy taking in thousands of bets for the baby's name. For weeks, they have been saying that Alice is the clear favorite. But in recent days Charlotte, the feminine form of Charles, has become the front runner. Other top possibilities included Olivia, Victoria, Elizabeth, Alexandra and Diana, the name of William's late mother. The newborn may herald a new generation in the monarchy, but it is customary for royals to look to their past for name ideas. The repetition of names in each generation is at least partly an effort to preserve the continuity of one of the world's oldest institutions. 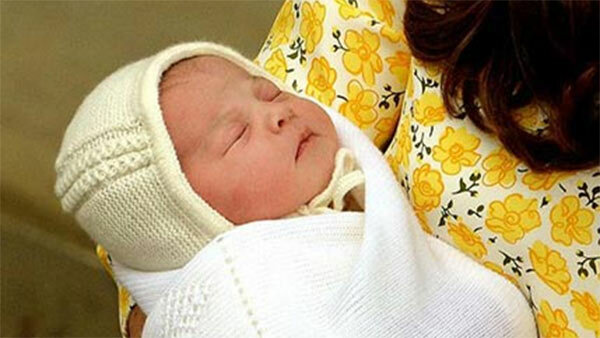 A princess called Charlotte - a name that is French in origin - would be a nod to her grandfather, Prince Charles. In royal history, George IV named his only child Charlotte, but she died in childbirth at 21. George III's wife was Queen Charlotte, who was born 1744. As for Alice: Queen Victoria named her second daughter Princess Alice, who was the great-grandmother of the queen's husband, Philip. Her granddaughter, also called Alice, was Philip's mother. Many think it is likely that William and Kate would use the name Diana - though probably as one of the baby's middle names to avoid comparisons with her late grandmother. Like most royals, the baby's brother, Prince George, has more than one middle name (George Alexander Louis), and the same treatment is expected for her. William and Kate introduced the baby princess Saturday evening to the world, just 12 hours after Kate checked into London's St. Mary's Hospital to give birth. The baby weighed in at 8 pounds, 3 ounces (3.7 kilograms). The couple issued a statement of thanks Sunday in response to the outpouring of goodwill and international interest in their baby. "The Duke and Duchess are hugely grateful for the messages of congratulations they have received from people all over the world," their press office said in a statement. "It means a great deal to them that so many people have celebrated the arrival of their new daughter." The princess is fourth in line to the British throne, after her grandfather Charles, her father William and her older brother George. She will be known formally as Her Royal Highness, Princess (name) of Cambridge. William's father and stepmother, Charles and Camilla, the Duchess of Cornwall, went to Kensington Palace on Sunday to visit the baby for the first time, joining Kate's parents Michael and Carole Middleton and her sister Pippa. Prince Harry, who is in Australia, said about his new niece: "She is absolutely beautiful. I can't wait to meet her." The royal couple is expected to spend several days at their London home before traveling to their country home on the queen's sprawling Sandringham estate, 120 miles (190 kilometers) north of London. The family is likely to stay out of the public eye in the coming days. The princess's birth has mesmerized much of Britain, eclipsing the country's hard-fought election campaign on the front pages of British newspapers. A number of London landmarks including Tower Bridge were lit in pink overnight to commemorate her birth.